In addition to the normal awards given at Skyhoundz Canine Disc Competitions, competitors can now earn a variety of competition titles. Effective immediately (see below for info. on nostalgia titling), the Hyperflite Skyhoundz Canine Disc Competition Series will now offer Skyhoundz Competition Titling at all Skyhoundz events including Local Championships, State Championships, DiscDogathon Qualifiers, DiscDogathon World Championship, Xtreme Distance Qualifiers, Xtreme Distance World Championship, Regional Qualifiers, Open Qualifiers, International Qualifiers, the European Championship, and the World Championship. Nostalgia Titling: Because Skyhoundz has maintained records going back to 2001 for its series of Qualifiers and World Championships, titling is also available for canines that competed at a Skyhoundz Qualifier or World Championship in years gone by. Check our competition results pages to see if you are eligible for a Skyhoundz Qualifier or World Championship Competition Title. If, after competing in a Skyhoundz event, you achieve a qualifying score, or qualifying competition placement, for one of nearly 150 available titles, you merely send in your competition scoresheet, or order online (depending on the title you are elgibile for), pay the nominal titling fee, and Skyhoundz will send you a Skyhoundz Canine Disc Competition Title Certificate suitable for framing. Your name and the name of the titled canine will be entered into our online registry in the appropriate titling class. If you want to memorialize your accomplishment for your trophy case, Skyhoundz can turn your title into a beautiful wall plaque which will look great alongside your other trophies, ribbons, and medals. Note: You do not have to register your canine or pay any type of membership fee to participate in Skyhoundz Competition Titling. All dogs, regardless of age or breeding (or lack thereof!) are eligible to earn any and all Skyhoundz Competition Titles. You pay only for the titles you earn and wish to formally record via the Skyhoundz Competition Titling System. Titles are always optional and are offered only to supplement other awards that are given out at Skyhoundz events. In fact, if you have no interest in titling, don't worry, because the Skyhoundz Canine Disc Competition Series will remain just as you've always know it to be — great fun for your canine. Skyhoundz Competition Titles are a great way to introduce lovers of other canine titling sports like Agility, Flyball, and Dock Diving, to canine disc play and competition. Skyhoundz Competiton Titles are optional. Those who elect not to participate in the titling program won't even notice it. Prequalification is not required for any Skyhoundz title. If you wish to leapfrog past Basic titles and go straight to Advanced, Expert, or Elite title classes, you can do so in your discretion. Any canine/human team may earn a Skyhoundz title at any Skyhoundz canine disc competition. A canine may also earn the same title with more than one human teammate. All proceeds from the Skyhoundz titling program support the Skyhoundz Canine Disc Championship Series, thereby ensuring that a new generation of canine disc enthusiasts will be able to enjoy the world's favorite canine sport. To earn DiscDogathon Qualifier (DQ) Titles title, you must compete in a Hyperflite Skyhoundz DiscDogathon World Championship Qualifier. Qualifying events and scores are listed below: Bullseye, Freestyle, Pairs Distance/Accuracy, Spot Landing, and TimeTrial. If you have received a qualifying score or placement for your canine, simply go here to order your title. The Skyhoundz DiscDogathon Qualifier Bullseye Basic Title (DQ-Bullseye Basic) is awarded to teams that score between 18-27 points in one round at a Skyhoundz DiscDogathon Qualifier. The Skyhoundz DiscDogathon Qualifier Bullseye Advanced Title (DQ-Bullseye Advanced) is awarded to teams that score between 28-37 points in one round at a Skyhoundz DiscDogathon Qualifier. The Skyhoundz DiscDogathon Qualifier Bullseye Expert Title (DQ-Bullseye Expert) is awarded to teams that score between 38-43 points in one round at a Skyhoundz DiscDogathon Qualifier. The Skyhoundz DiscDogathon Qualifier Bullseye Elite Title (DQ-Bullseye Elite) is awarded to teams that score 44 or more points in one round at a Skyhoundz DiscDogathon Qualifier. The Skyhoundz DiscDogathon Qualifier Freestyle Basic Title (DQ-Freestyle Basic) is awarded to teams that score between 24-27.5 points in one round at a Skyhoundz DiscDogathon Qualifier. The Skyhoundz DiscDogathon Qualifier Freestyle Advanced Title (DQ-Freestyle Advanced) is awarded to teams that score between 28-31.5 points in one round at a Skyhoundz DiscDogathon Qualifier. The Skyhoundz DiscDogathon Qualifier Freestyle Expert Title (DQ-Freestyle Expert) is awarded to teams that score between 32-36.5 points in one round at a Skyhoundz DiscDogathon Qualifier. The Skyhoundz DiscDogathon Qualifier Freestyle Elite Title (DQ-Freestyle Elite) is awarded to teams that score 37 or more points in one round at a Skyhoundz DiscDogathon Qualifier. The Skyhoundz DiscDogathon Qualifier Pairs Distance/Accuracy Basic Title (DQ-Pairs Distance/Accuracy Basic) is awarded to teams that score between 8-11.5 points in one round at a Skyhoundz DiscDogathon Qualifier. The Skyhoundz DiscDogathon Qualifier Pairs Distance/Accuracy Advanced Title (DQ-Pairs Distance/Accuracy Advanced) is awarded to teams that score between 12-14.5 points in one round at a Skyhoundz DiscDogathon Qualifier. The Skyhoundz DiscDogathon Qualifier Pairs Distance/Accuracy Expert Title (DQ-Pairs Distance/Accuracy Expert) is awarded to teams that score between 15-19.5 points in one round at a Skyhoundz DiscDogathon Qualifier. The Skyhoundz DiscDogathon Qualifier Pairs Distance/Accuracy Elite Title (DQ-Pairs Distance/Accuracy Elite) is awarded to teams that score 20 or more points in one round at a Skyhoundz DiscDogathon Qualifier. The Skyhoundz DiscDogathon Qualifier Spot Landing Basic Title (DQ-Spot Landing Basic) is awarded to teams that score between 15-21 points in one round at a Skyhoundz DiscDogathon Qualifier. The Skyhoundz DiscDogathon Qualifier Spot Landing Advanced Title (DQ-Spot Landing Advanced) is awarded to teams that score between 22-29 points in one round at a Skyhoundz DiscDogathon Qualifier. The Skyhoundz DiscDogathon Qualifier Spot Landing Expert Title (DQ-Spot Landing Expert) is awarded to teams that score between 30-44 points in one round at a Skyhoundz DiscDogathon Qualifier. The Skyhoundz DiscDogathon Qualifier Spot Landing Elite Title (DQ-Spot Landing Elite) is awarded to teams that score 45 or more points in one round at a Skyhoundz DiscDogathon Qualifier. The Skyhoundz DiscDogathon Qualifier Time Trial Basic Title (DQ-TimeTrial Basic) is awarded to teams that record a time of between 30.00-35.00 seconds during one round at a Skyhoundz DiscDogathon Qualifier. The Skyhoundz DiscDogathon Qualifier Time Trial Advanced Title (DQ-TimeTrial Advanced) is awarded to teams that record a time of between 25.00-29.99 seconds during one round at a Skyhoundz DiscDogathon Qualifier. The Skyhoundz DiscDogathon Qualifier Time Trial Expert Title (DQ-TimeTrial Expert) is awarded to teams that record a time of between 18.00-24.99 seconds during one round at a Skyhoundz DiscDogathon Qualifier. The Skyhoundz DiscDogathon Qualifier Time Trial Elite Title (DQ-TimeTrial Elite) is awarded to teams that record a time of 17.99 or less seconds during one round at a Skyhoundz DiscDogathon Qualifier. To earn DiscDogathon World Championship (DW) Titles title, you must compete in a Hyperflite Skyhoundz DiscDogathon World Championship. Qualifying events and scores are listed below: Bullseye, Freestyle, Pairs Distance/Accuracy, Spot Landing, and TimeTrial. The Skyhoundz DiscDogathon World Championship Bullseye Basic Title (DW-Bullseye Basic) is awarded to teams that score between 18-27 points in one round at a Skyhoundz DiscDogathon World Championship. The Skyhoundz DiscDogathon World Championship Bullseye Advanced Title (DW-Bullseye Advanced) is awarded to teams that finish in 4th, 5th, or 6th place at a Skyhoundz DiscDogathon World Championship. The Skyhoundz DiscDogathon World Championship Bullseye Advanced Title (DW-Bullseye Advanced) is awarded to teams that finish in 1st, 2nd, or 3rd place at a Skyhoundz DiscDogathon World Championship. The Skyhoundz DiscDogathon World Championship Bullseye Elite Title (DW-Bullseye Elite) is awarded to teams that score 44 or more points in one round at a Skyhoundz DiscDogathon World Championship. The Skyhoundz DiscDogathon World Championship Freestyle Basic Title (DW-Freestyle Basic) is awarded to teams that score between 24-27.5 points in one round at a Skyhoundz DiscDogathon World Championship. The Skyhoundz DiscDogathon World Championship Freestyle Advanced Title (DW-Bullseye Advanced) is awarded to teams that finish in 4th, 5th, or 6th place at a Skyhoundz DiscDogathon World Championship. The Skyhoundz DiscDogathon World Championship Freestyle Advanced Title (DW-Bullseye Advanced) is awarded to teams that finish in 1st, 2nd, or 3rd place at a Skyhoundz DiscDogathon World Championship. The Skyhoundz DiscDogathon World Championship Freestyle Elite Title (DW-Freestyle Elite) is awarded to teams that score 37 or more points in one round at a Skyhoundz DiscDogathon World Championship. The Skyhoundz DiscDogathon World Championship Pairs Distance/Accuracy Basic Title (DW-Pairs Distance/Accuracy Basic) is awarded to teams that score between 8-11.5 points in one round at a Skyhoundz DiscDogathon World Championship. The Skyhoundz DiscDogathon World Championship Pairs Distance/Accuracy Advanced Title (DW-Bullseye Advanced) is awarded to teams that finish in 4th, 5th, or 6th place at a Skyhoundz DiscDogathon World Championship. The Skyhoundz DiscDogathon World Championship Pairs Distance/Accuracy Advanced Title (DW-Pairs Distance/Accuracy Advanced) is awarded to teams that finish in 1st, 2nd, or 3rd place at a Skyhoundz DiscDogathon World Championship. The Skyhoundz DiscDogathon World Championship Pairs Distance/Accuracy Elite Title (DW-Pairs Distance/Accuracy Elite) is awarded to teams that score 20 or more points in one round at a Skyhoundz DiscDogathon World Championship. The Skyhoundz DiscDogathon World Championship Spot Landing Basic Title (DW-Spot Landing Basic) is awarded to teams that score between 15-21 points in one round at a Skyhoundz DiscDogathon World Championship. The Skyhoundz DiscDogathon World Championship Spot Landing Advanced Title (DW-Bullseye Advanced) is awarded to teams that finish in 4th, 5th, or 6th place at a Skyhoundz DiscDogathon World Championship. The Skyhoundz DiscDogathon World Championship Spot Landing Advanced Title (DW-Bullseye Advanced) is awarded to teams that finish in 1st, 2nd, or 3rd place at a Skyhoundz DiscDogathon World Championship. The Skyhoundz DiscDogathon World Championship Spot Landing Elite Title (DW-Spot Landing Elite) is awarded to teams that score 45 or more points in one round at a Skyhoundz DiscDogathon World Championship. The Skyhoundz DiscDogathon World Championship TimeTrial Basic Title (DW-Time Trial Basic) is awarded to teams that record a time of between 30.00-35.00 seconds during one round at a Skyhoundz DiscDogathon World Championship. The Skyhoundz DiscDogathon World Championship TimeTrial Advanced Title (DW-Bullseye Advanced) is awarded to teams that finish in 4th, 5th, or 6th place at a Skyhoundz DiscDogathon World Championship. The Skyhoundz DiscDogathon World Championship TimeTrial Advanced Title (DW-Bullseye Advanced) is awarded to teams that finish in 1st, 2nd, or 3rd place at a Skyhoundz DiscDogathon World Championship. The Skyhoundz DiscDogathon World Championship TimeTrial Elite Title (DW-Time Trial Elite) is awarded to teams that record a time a time of 17.99 or less seconds during one round at a Skyhoundz DiscDogathon World Championship. To earn Skyhoundz Championship (SC) Titles, you must compete in a Hyperflite Skyhoundz Local or State Championship. Qualifying events and scores are listed below: Distance/Accuracy, Freestyle. The Skyhoundz Championship Distance/Accuracy Basic Title (SC-Distance/Accuracy Basic) is awarded to teams that score between 8-11.5 points in one Distance/Accuracy round at a Skyhoundz Local or State Championship. The Skyhoundz Championship Distance/Accuracy Advanced Title (SC-Distance/Accuracy Advanced) is awarded to teams that score between 12-14.5 points in one Distance/Accuracy round at a Skyhoundz Local or State Championship. The Skyhoundz Championship Distance/Accuracy Expert Title (SC-Distance/Accuracy Expert) is awarded to teams that score between 15-19.5 points in one Distance/Accuracy round at a Skyhoundz Local or State Championship. The Skyhoundz Championship Distance/Accuracy Elite Title (SC-Distance/Accuracy Elite) is awarded to teams that score 20 or more points in one Distance/Accuracy round at a Skyhoundz Local or State Championship. The Skyhoundz Championship Freestyle Basic Title (SC-Freestyle Basic) is awarded to teams that score between 24-29.5 points in one Freestyle round at a Skyhoundz Local or State Championship. The Skyhoundz Championship Freestyle Advanced Title (SC-Freestyle Advanced) is awarded to teams that score between 30-32.5 points in one Freestyle round at a Skyhoundz Local or State Championship. The Skyhoundz Championship Freestyle Expert Title (SC-Freestyle Expert) is awarded to teams that score between 33-35.5 points in one Freestyle round at a Skyhoundz Local or State Championship. The Skyhoundz Championship Freestyle Elite Title (SC-Freestyle Elite) is awarded to teams that score 36 or more points in one Freestyle round at a Skyhoundz Local or State Championship. To earn Skyhoundz Qualifier (SQ) Titles, you must compete in a Hyperflite Skyhoundz Qualifier. Qualifying events and scores are listed below: MicroDog, Open, Pairs Freestyle, Sport, or Youth. The Skyhoundz Qualifier MicroDog Basic Title (SQ-MicroDog Basic) is awarded to teams that attain a score of 24 or more points in one round of MicroDog Freestyle at a Skyhoundz Regional, Open, or International Qualifier. The Skyhoundz Qualifier MicroDog Advanced Title (SQ-MicroDog Advanced) is awarded to teams that finish in 4th, 5th, or 6th place at a Skyhoundz Regional, Open, or International Qualifier. The Skyhoundz Qualifier MicroDog Expert Title (SQ-MicroDog Expert) is awarded to teams that finish in 1st, 2nd, or 3rd place at a Skyhoundz Regional, Open, or International Qualifier. The Skyhoundz Qualifier MicroDog Elite Title (SQ-MicroDog Elite) is awarded to teams that attain an overall score of 75 or more points at a Skyhoundz Regional, Open, or International Qualifier. The Skyhoundz Qualifier Open Basic Title (SQ-Open Basic) is awarded to teams that attain a score of 24 or more points in one round of Freestyle at a Skyhoundz Regional, Open, or International Qualifier in the Open Division/Expert Class. The Skyhoundz Qualifier Open Advanced Title (SQ-Open Advanced) is awarded to teams that finish in 4th, 5th, or 6th place at a Skyhoundz Regional, Open, or International Qualifier in the Open Division/Expert Class. The Skyhoundz Qualifier Open Expert Title (SQ-Open Expert) is awarded to teams that finish in 1st, 2nd, or 3rd place at a Skyhoundz Regional, Open, or International Qualifier in the Open Division/Expert Class. The Skyhoundz Qualifier Open Elite Title (SQ-Open Elite) is awarded to teams that attain an overall score of 90 or more points at a Skyhoundz Regional, Open, or International Qualifier in the Open Division/Expert Class. The Skyhoundz Qualifier Pairs Freestyle Title (SQ-Pairs Freestyle Basic) is awarded to teams that score 30 or more points in any one round of Pairs Freestyle at a Skyhoundz Regional, Open, or International Qualifier. The Skyhoundz Qualifier Pairs Freestyle Advanced Title (SQ-Pairs Freestyle Advanced) is awarded to teams that finish in 4th, 5th, or 6th place at a Skyhoundz Regional, Open, or International Qualifier. The Skyhoundz Qualifier Pairs Freestyle Expert Title (SQ-Pairs Freestyle Expert) is awarded to teams that that finish in 1st, 2nd, or 3rd place at a Skyhoundz Regional, Open, or International Qualifier. The Skyhoundz Qualifier Pairs Freestyle Elite Title (SQ-Pairs Freestyle Elite) is awarded to teams that that attain an overall score of 45 or more points in any one round of Pairs Freestyle at a Skyhoundz Regional, Open, or International Qualifier. The Skyhoundz Qualifier Sport Basic Title (SQ-Sport Basic) is awarded to teams that attain a score of 12 or more points at a Skyhoundz Regional, Open, or International Qualifier in the Sport Division/Expert Class. The Skyhoundz Qualifier Sport Advanced Title (SQ-Sport Advanced) is awarded to teams that finish in 4th, 5th, or 6th place at a Skyhoundz Regional, Open, or International Qualifier in the Sport Division/Expert Class. The Skyhoundz Qualifier Sport Basic Title (SQ-Sport Basic) is awarded to teams that finish in 1st, 2nd, or 3rd place at a Skyhoundz Regional, Open, or International Qualifier in the Sport Division/Expert Class. The Skyhoundz Qualifier Sport Basic Title (SQ-Sport Basic) is awarded to teams that attain a score of 40 or more points for two rounds of Distance/Accuracy at a Skyhoundz Regional, Open, or International Qualifier in the Sport Division/Expert Class. The Skyhoundz Qualifier Youth Basic Title (SQ-Youth Basic) is awarded to teams that attain a score 20 or more points in one round of Freestyle at a Skyhoundz Regional, Open, or International Qualifier. The Skyhoundz Qualifier Youth Advanced Title (SQ-Youth Advanced) is awarded to teams that finish in 4th, 5th, or 6th place at a Skyhoundz Regional, Open, or International Qualifier. The Skyhoundz Qualifier Youth Expert Title (SQ-Youth Expert) is awarded to teams that finish in 1st, 2nd, or 3rd place at a Skyhoundz Regional, Open, or International Qualifier. The Skyhoundz Qualifier Youth Elite Title (SQ-Youth Elite) is awarded to teams that that attain an overall score of 75 or more points at a Skyhoundz Regional, Open, or International Qualifier. To earn Skyhoundz World Championship (SW) Titles, you must compete in a Hyperflite Skyhoundz World Championship. Qualifying events and scores are listed below: MicroDog, Open, Pairs Freestyle, Sport, or Youth. The Skyhoundz World Championship MicroDog Basic Title (SW-MicroDog Basic) is awarded to teams that attain a score of 28 or more points in one round of MicroDog Freestyle at the Skyhoundz World Championship. The Skyhoundz World Championship MicroDog Advanced Title (SW-MicroDog Advanced) is awarded to teams that finish in 4th, 5th, or 6th place at the Skyhoundz World Championship. The Skyhoundz World Championship MicroDog Expert Title (SW-MicroDog Expert) is awarded to teams that finish in 1st, 2nd, or 3rd place at the Skyhoundz World Championship. The Skyhoundz World Championship MicroDog Elite Title (SW-MicroDog Elite) is awarded to teams that attain an overall score of 75 or more points at the Skyhoundz World Championship. The Skyhoundz World Championship Open Basic Title (SW-Open Basic) is awarded to teams that attain a score of 28 or more points in one round of Freestyle at the Skyhoundz World Championship. The Skyhoundz World Championship Open Advanced Title (SW-Open Advanced) is awarded to teams that finish in 4th, 5th, or 6th place at the Skyhoundz World Championship. The Skyhoundz World Championship Open Expert Title (SW-Open Expert) is awarded to teams that finish in 1st, 2nd, or 3rd place at the Skyhoundz World Championship. 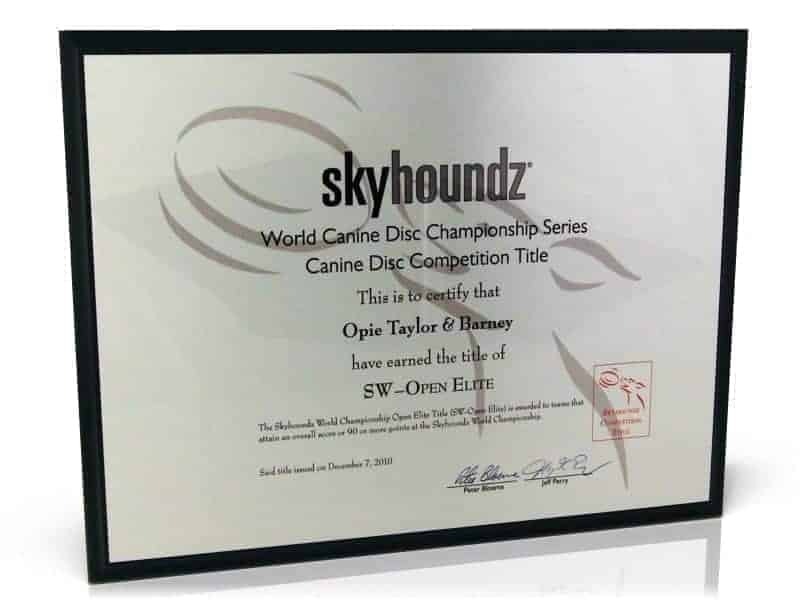 The Skyhoundz World Championship Open Elite Title (SW-Open Elite) is awarded to teams that attain an overall score or 90 or more points at the Skyhoundz World Championship. The Skyhoundz World Championship Pairs Freestyle Title (SW-Pairs Freestyle Basic) is awarded to teams that attain a score of 35 or more points in any one round of Pairs Freestyle at the Skyhoundz World Championship. The Skyhoundz World Championship Pairs Freestyle Advanced Title (SW-Pairs Freestyle Advanced) is awarded to teams that finish in 4th, 5th, or 6th place at the Skyhoundz World Championship. The Skyhoundz World Championship Pairs Freestyle Expert Title (SW-Pairs Freestyle Expert) is awarded to teams that that finish in 1st, 2nd, or 3rd place at the Skyhoundz World Championship. The Skyhoundz World Championship Pairs Freestyle Elite Title (SW-Pairs Freestyle Elite) is awarded to teams that that attain an overall score of 45 or more points in any one round of Pairs Freestyle at the Skyhoundz World Championship. The Skyhoundz World Championship Sport Basic Title (SW-Sport Basic) is awarded to teams that attain a score of 15 or more points at the Skyhoundz World Championship. The Skyhoundz World Championship Sport Advanced Title (SW-Sport Advanced) is awarded to teams that finish in 4th, 5th, or 6th place at the Skyhoundz World Championship. The Skyhoundz World Championship Sport Basic Title (SW-Sport Basic) is awarded to teams that finish in 1st, 2nd, or 3rd place at the Skyhoundz World Championship. The Skyhoundz World Championship Sport Basic Title (SW-Sport Basic) is awarded to teams that attain a score of 40 or more points for two rounds of Distance/Accuracy at the Skyhoundz World Championship. The Skyhoundz World Championship Youth Basic Title (SW-Youth Basic) is awarded to teams that attain a score of 28 or more points in one round of Freestyle at the Skyhoundz World Championship. The Skyhoundz World Championship Youth Advanced Title (SW-Youth Advanced) is awarded to teams that finish in 4th, 5th, or 6th place at the Skyhoundz World Championship. The Skyhoundz World Championship Youth Expert Title (SW-Youth Expert) is awarded to teams that finish in 1st, 2nd, or 3rd place at the Skyhoundz World Championship. The Skyhoundz World Championship Youth Elite Title (SW-Youth Elite) is awarded to teams that that attain an overall score of 75 or more points at the Skyhoundz World Championship. To earn Skyhoundz Xtreme Distance Challenge (XQ) Titles, you must compete in a Hyperflite Skyhoundz Xtreme Distance Qualifier. Qualifying events and scores are listed below: Men's MicroDog, Women's MicroDog, Men's Light Plastic, Women's Light Plastic, Men's Classic Plastic, Women's Classic Plastic, Men's Unlimited Plastic, Women's Unlimited Plastic. Skyhoundz Xtreme Distance Qualifier Men's MicroDog Basic Title (XQ-MM Basic) is awarded to teams that record a successful catch of between 80-94 feet at a Skyhoundz Xtreme Distance Qualifier. Skyhoundz Xtreme Distance Qualifier Men's MicroDog Advanced Title (XQ-MM Advanced) is awarded to teams that record a successful catch of between 95-104 feet at a Skyhoundz Xtreme Distance Qualifier. Skyhoundz Xtreme Distance Qualifier Men's MicroDog Expert Title (XQ-MM Masters) is awarded to teams that record a successful catch of between 105-119 feet at a Skyhoundz Xtreme Distance Qualifier. Skyhoundz Xtreme Distance Qualifier Men's MicroDog Elite Title (XQ-MM Elite) is awarded to teams that record a successful catch of 120 or more feet at a Skyhoundz Xtreme Distance Qualifier. Skyhoundz Xtreme Distance Qualifier Women's MicroDog Basic Title (XQ-WM Basic) is awarded to teams that record a successful catch of between 60-69 feet at a Skyhoundz Xtreme Distance Qualifier. Skyhoundz Xtreme Distance Qualifier Women's MicroDog Advanced Title (XQ-WM Advanced) is awarded to teams that record a successful catch of between 70-79 feet at a Skyhoundz Xtreme Distance Qualifier. Skyhoundz Xtreme Distance Qualifier Women's MicroDog Expert Title (XQ-WM Masters) is awarded to teams that record a successful catch of between 80-89 feet at a Skyhoundz Xtreme Distance Qualifier. Skyhoundz Xtreme Distance Qualifier Women's MicroDog Elite Title (XQ-WM Elite) is awarded to teams that record a successful catch of 90 or more feet at a Skyhoundz Xtreme Distance Qualifier. Skyhoundz Xtreme Distance Qualifier Men’s Light Plastic Basic Title (XQ-MLP Basic) is awarded to teams that record a successful catch of between 105-149.11 feet at a Skyhoundz Xtreme Distance Qualifier. Skyhoundz Xtreme Distance Qualifier Men’s Light Plastic Advanced Title (XQ-MLP Advanced) is awarded to teams that record a successful catch of between 150-179.11 feet at a Skyhoundz Xtreme Distance Qualifier. Skyhoundz Xtreme Distance Qualifier Men’s Light Plastic Expert Title (XQ-MLP Masters) is awarded to teams that record a successful catch of between 180-209.11 feet at a Skyhoundz Xtreme Distance Qualifier. Skyhoundz Xtreme Distance Qualifier Men’s Light Plastic Elite Title (XQ-MLP Elite) is awarded to teams that record a successful catch of 210 or more feet at a Skyhoundz Xtreme Distance Qualifier. Skyhoundz Xtreme Distance Qualifier Women’s Light Plastic Basic Title (XQ-WLP Basic) is awarded to teams that record a successful catch of between 75-89.11 feet at a Skyhoundz Xtreme Distance Qualifier. Skyhoundz Xtreme Distance Qualifier Women’s Light Plastic Advanced Title (XQ-WLP Advanced) is awarded to teams that record a successful catch of between 90-119.11 feet at a Skyhoundz Xtreme Distance Qualifier. Skyhoundz Xtreme Distance Qualifier Women’s Light Plastic Expert Title (XQ-WLP Masters) is awarded to teams that record a successful catch of between 120-179.11 feet at a Skyhoundz Xtreme Distance Qualifier. Skyhoundz Xtreme Distance Qualifier Women’s Light Plastic Elite Title (XQ-WLP Elite) is awarded to teams that record a successful catch of 180 or more feet at a Skyhoundz Xtreme Distance Qualifier. Skyhoundz Xtreme Distance Qualifier Men’s Classic Plastic Basic Title (XQ-MCP Basic) is awarded to teams that record a successful catch of between 120-179.11 feet at a Skyhoundz Xtreme Distance Qualifier. Skyhoundz Xtreme Distance Qualifier Men’s Classic Plastic Advanced Title (XQ-MCP Advanced) is awarded to teams that record a successful catch of between 180-209.11 feet at a Skyhoundz Xtreme Distance Qualifier. Skyhoundz Xtreme Distance Qualifier Men’s Classic Plastic Expert Title (XQ-MCP Masters) is awarded to teams that record a successful catch of between 210-269.11 feet at a Skyhoundz Xtreme Distance Qualifier. Skyhoundz Xtreme Distance Qualifier Men’s Classic Plastic Elite Title (XQ-MCP Elite) is awarded to teams that record a successful catch of 270 or more feet at a Skyhoundz Xtreme Distance Qualifier. Skyhoundz Xtreme Distance Qualifier Women’s Classic Plastic Basic Title (XQ-WCP Basic) is awarded to teams that record a successful catch of between 90-119.11 feet at a Skyhoundz Xtreme Distance Qualifier. Skyhoundz Xtreme Distance Qualifier Women’s Classic Plastic Advanced Title (XQ-WCP Advanced) is awarded to teams that record a successful catch of between 120-149.11 feet at a Skyhoundz Xtreme Distance Qualifier. Skyhoundz Xtreme Distance Qualifier Women’s Classic Plastic Expert Title (XQ-WCP Masters) is awarded to teams that record a successful catch of between 150-179.99 feet at a Skyhoundz Xtreme Distance Qualifier. Skyhoundz Xtreme Distance Qualifier Women’s Classic Plastic Elite Title (XQ-WCP Elite) is awarded to teams that record a successful catch of 180 or more feet at a Skyhoundz Xtreme Distance Qualifier. Skyhoundz Xtreme Distance Qualifier Men’s Unlimited Plastic Basic Title (XQ-MUP Basic) is awarded to teams that record a successful catch of between 135-179.11 feet at a Skyhoundz Xtreme Distance Qualifier. Skyhoundz Xtreme Distance Qualifier Men’s Unlimited Plastic Advanced Title (XQ-MUP Advanced) is awarded to teams that record a successful catch of between 180-209.11 feet at a Skyhoundz Xtreme Distance Qualifier. Skyhoundz Xtreme Distance Qualifier Men’s Unlimited Plastic Expert Title (XQ-MUP Masters) is awarded to teams that record a successful catch of between 210-269.11 feet at a Skyhoundz Xtreme Distance Qualifier. Skyhoundz Xtreme Distance Qualifier Men’s Unlimited Plastic Elite Title (XQ-MUP Elite) is awarded to teams that record a successful catch of 270 or more feet at a Skyhoundz Xtreme Distance Qualifier. Skyhoundz Xtreme Distance Qualifier Women’s Unlimited Plastic Basic Title (XQ-WUP Basic) is awarded to teams that record a successful catch of between 105-119.11 feet at a Skyhoundz Xtreme Distance Qualifier. Skyhoundz Xtreme Distance Qualifier Women’s Unlimited Plastic Advanced Title (XQ-WUP Advanced) is awarded to teams that record a successful catch of between 120-149.11 feet at a Skyhoundz Xtreme Distance Qualifier. Skyhoundz Xtreme Distance Qualifier Women’s Unlimited Plastic Expert Title (XQ-WUP Masters) is awarded to teams that record a successful catch of between 150-179.11 feet at a Skyhoundz Xtreme Distance Qualifier. Skyhoundz Xtreme Distance Qualifier Women’s Unlimited Plastic Elite Title (XQ-WUP Elite) is awarded to teams that record a successful catch of 180 or more feet at a Skyhoundz Xtreme Distance Qualifier. To earn Skyhoundz Xtreme Distance World Championship (XD) Titles, you must compete in a Hyperflite Skyhoundz Xtreme Distance World Championship. Qualifying events and scores are listed below: Men's MicroDog, Women's MicroDog, Men's Light Plastic, Women's Light Plastic, Men's Classic Plastic, Women's Classic Plastic, Men's Unlimited Plastic, Women's Unlimited Plastic. Skyhoundz Xtreme Distance World Championship Men's MicroDog Basic Title (XW-MM Basic) is awarded to teams that record a successful catch of between 100-179 feet at a Skyhoundz Xtreme Distance World Championship. Skyhoundz Xtreme Distance World Championship Men's MicroDog Advanced Title (XW-MM Advanced) is awarded to teams that finish in 4th, 5th, or 6th place at a Skyhoundz Xtreme Distance World Championship. Skyhoundz Xtreme Distance World Championship Men's MicroDog Expert Title (XW-MM Masters) is awarded to teams that finish in 1st, 2nd, or 3rd place at a Skyhoundz Xtreme Distance World Championship. Skyhoundz Xtreme Distance World Championship Men's MicroDog Elite Title (XW-MM Elite) is awarded to teams that record a successful catch of 180 or more feet at a Skyhoundz Xtreme Distance World Championship. Skyhoundz Xtreme Distance World Championship Women's MicroDog Basic Title (XW-WM Basic) is awarded to teams that record a successful catch of between 100-119 feet at a Skyhoundz Xtreme Distance World Championship. Skyhoundz Xtreme Distance World Championship Women's MicroDog Advanced Title (XW-WM Advanced) is awarded to teams that finish in 4th, 5th, or 6th place at a Skyhoundz Xtreme Distance World Championship. Skyhoundz Xtreme Distance World Championship Women's MicroDog Expert Title (XW-WM Masters) is awarded to teams that finish in 1st, 2nd, or 3rd place at a Skyhoundz Xtreme Distance World Championship. Skyhoundz Xtreme Distance World Championship Women's MicroDog Elite Title (XW-WM Elite) is awarded to teams that record a successful catch of 120 or more feet at a Skyhoundz Xtreme Distance World Championship. Skyhoundz Xtreme Distance World Championship Men’s Light Plastic Basic Title (XW-MLP Basic) is awarded to teams that record a successful catch of 120 or more feet at a Skyhoundz Xtreme Distance World Championship. Skyhoundz Xtreme Distance World Championship Men’s Light Plastic Advanced Title (XW-MLP Advanced) is awarded to teams that finish in 4th, 5th, or 6th place at a Skyhoundz Xtreme Distance World Championship. Skyhoundz Xtreme Distance World Championship Men’s Light Plastic Expert Title (XW-MLP Masters) is awarded to teams that finish in 1st, 2nd, or 3rd place at a Skyhoundz Xtreme Distance World Championship. Skyhoundz Xtreme Distance World Championship Men’s Light Plastic Elite Title (XW-MLP Elite) is awarded to teams that record a successful catch of 225 or more feet at a Skyhoundz Xtreme Distance World Championship. Skyhoundz Xtreme Distance World Championship Women’s Light Plastic Basic Title (XW-WLP Basic) is awarded to teams that record a successful catch of 90 or more feet at a Skyhoundz Xtreme Distance World Championship. Skyhoundz Xtreme Distance World Championship Women’s Light Plastic Advanced Title (XW-WLP Advanced) is awarded to teams that finish in 4th, 5th, or 6th place at a Skyhoundz Xtreme Distance World Championship. Skyhoundz Xtreme Distance World Championship Women’s Light Plastic Expert Title (XW-WLP Masters) is awarded to teams that finish in 1st, 2nd, or 3rd place at a Skyhoundz Xtreme Distance World Championship. Skyhoundz Xtreme Distance World Championship Women’s Light Plastic Elite Title (XW-WLP Elite) is awarded to teams that record a successful catch of 180 or more feet at a Skyhoundz Xtreme Distance World Championship. Skyhoundz Xtreme Distance World Championship Men’s Classic Plastic Basic Title (XW-MCP Basic) is awarded to teams that record a successful catch of 135 or more feet at a Skyhoundz Xtreme Distance World Championship. Skyhoundz Xtreme Distance World Championship Men’s Classic Plastic Advanced Title (XW-MCP Advanced) is awarded to teams that finish in 4th, 5th, or 6th place at a Skyhoundz Xtreme Distance World Championship. Skyhoundz Xtreme Distance World Championship Men’s Classic Plastic Expert Title (XW-MCP Masters) is awarded to teams that finish in 1st, 2nd, or 3rd place at a Skyhoundz Xtreme Distance World Championship. Skyhoundz Xtreme Distance World Championship Men’s Classic Plastic Elite Title (XW-MCP Elite) is awarded to teams that record a successful catch of 270 or more feet at a Skyhoundz Xtreme Distance World Championship. Skyhoundz Xtreme Distance World Championship Women’s Classic Plastic Basic Title (XW-WCP Basic) is awarded to teams that record a successful catch of 105 or more feet at a Skyhoundz Xtreme Distance World Championship. Skyhoundz Xtreme Distance World Championship Women’s Classic Plastic Advanced Title (XW-WCP Advanced) is awarded to teams that finish in 4th, 5th, or 6th place at a Skyhoundz Xtreme Distance World Championship. Skyhoundz Xtreme Distance World Championship Women’s Classic Plastic Expert Title (XW-WCP Masters) is awarded to teams that finish in 1st, 2nd, or 3rd place at a Skyhoundz Xtreme Distance World Championship. Skyhoundz Xtreme Distance World Championship Women’s Classic Plastic Elite Title (XW-WCP Elite) is awarded to teams that record a successful catch of 120 or more feet at a Skyhoundz Xtreme Distance World Championship. Skyhoundz Xtreme Distance World Championship Men’s Unlimited Plastic Basic Title (XW-MUP Basic) is awarded to teams that record a successful catch of 150 or more feet at a Skyhoundz Xtreme Distance World Championship. Skyhoundz Xtreme Distance World Championship Men’s Unlimited Plastic Advanced Title (XW-MUP Advanced) is awarded to teams that finish in 4th, 5th, or 6th place at a Skyhoundz Xtreme Distance World Championship. Skyhoundz Xtreme Distance World Championship Men’s Unlimited Plastic Expert Title (XW-MUP Masters) is awarded to teams that finish in 1st, 2nd, or 3rd place at a Skyhoundz Xtreme Distance World Championship. Skyhoundz Xtreme Distance World Championship Men’s Unlimited Plastic Elite Title (XW-MUP Elite) is awarded to teams that record a successful catch of 270 or more feet at a Skyhoundz Xtreme Distance World Championship. Skyhoundz Xtreme Distance World Championship Women’s Unlimited Plastic Basic Title (XW-WUP Basic) is awarded to teams that record a successful catch of 105 or more feet at a Skyhoundz Xtreme Distance World Championship. Skyhoundz Xtreme Distance World Championship Women’s Unlimited Plastic Advanced Title (XW-WUP Advanced) is awarded to teams that finish in 4th, 5th, or 6th place at a Skyhoundz Xtreme Distance World Championship. Skyhoundz Xtreme Distance World Championship Women’s Unlimited Plastic Expert Title (XW-WUP Masters) is awarded to teams that finish in 1st, 2nd, or 3rd place at a Skyhoundz Xtreme Distance World Championship. Skyhoundz Xtreme Distance World Championship Women’s Unlimited Plastic Elite Title (XW-WUP Elite) is awarded to teams that record a successful catch of 180 or more feet at a Skyhoundz Xtreme Distance World Championship.